Green Voice of Freedom: Authorities in Iran have agreed to allow imprisoned opposition leader Mehdi Karroubi to be examined by a trusted doctor and to be hospitalised following a deterioration in his health, a site close to the Karroubi family reported on Friday. According to Saham news, on Thursday security officials told the family that Karroubi would be allowed to receive medical treatment in a hospital. However, a day later the site reported that authorities were still refusing to transfer the cleric to the hospital. Despite agreeing to provide the family and Karroubi’s trusted doctor as well as all his medical records, officials have only released some of the test results. Opposition sites recently reported that Karroubi’s health had taken a worrying turn for the worse and that the former parliament speaker had experienced significant weight loss, nausea, dizziness and a loss of appetite. He was placed under detention again shortly after undergoing medical tests at a hospital. 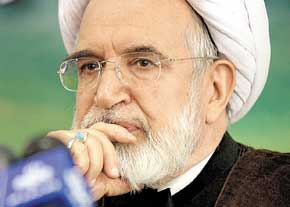 On Friday, a doctor appointed by the security apparatus treated Karroubi for a second time, Saham news said. “Despite prescribing medicine, no positive change has been seen in his health,” it added. A member of the Karroubi family has been allowed to accompany the 2009 presidential candidate who has been under house arrest, along with fellow opposition leader Mir Hossein Mousavi and wife Zahra Rahnavard, since February 2011. Meanwhile, Mousavi advisor Ardeshir Amir-Arjomand recently told the BBC’s Persian service that the former prime minister had also been taken to hospital for medical examinations following heart pain and blood pressure fluctuations. The news comes more than two months after Mousavi underwent surgery after suffering from cardiac complications. Less than 24 hours after that operation, Mousavi was returned to house arrest. Mousavi’s wife Zahra Rahnavard has also reportedly developed health complications while under house arrest. Kaleme, a site associated with Mousavi, says that as of late Rahnavard has been experiencing shivering in her face and arms, something unprecedented prior to her house arrest. Mousavi’s daughters are also facing increasing harassment and threats from state agents for their role in disseminating news about their parents’ condition. One of the daughters has already been barred from seeing her parents. On Wednesday, renowned human rights activist and Nobel laureate Shirin Ebadi said that Mousavi, Karroubi and Rahnavard were being held in conditions worse than all of Iran’s political prisoners. “Why is their condition worse? Because they face all the limitations and abuses that other political prisoners face. However, it is clear where the other [prisoners] are held and in which court they are tried,” Ebad said. Including Karubi amongst "Prisoners of the Day" ruins this whole thread which has been the best thing on IC. Both Karroubi and Mousavi need to be under 6 ft of dirt. Since they are not, they deserve life in prison. House arrest is like vacation for these bastards. I hope IDC stops promoting this nonsense. I am shocked to see Karoobi being named as the prisoner of the day. He must be in a real prison, house arrent is not good enough for the crimes he committed during his power in the politics of Iran. His brother still owes billions to the banks which Karoobi helped to get at 3% interest and loaned back to ordinary people at 20 to 35% interest. This man is a criminal . Mousavi, Khatami & Mehdi are no better than the Regime, these guys with the west helped give us the Regime, they Lead people to creating it and are being harmed by the Regime that has harmed many others under their authority. No one deserves what they are going through, however like the rest of the IRI they do need to face justice for the crimes allegedly committed against Iranians as a result of their unlawful activities in the Regime. Iran’s salvation from 34 years of heinous barbarism at the hands of Messianic Islamist Rapists, “reformers” and all, is in regime change.